Very compact and light bypass oil cleaners, specially designed to clean engine oil. The TR bypass filter connects directly to the engine main gallery, and the cleaned oil is returned to the engine oil pan. E-series: normal element for engine oil. X-series: "long life" element with a 50% higher dirt capacity and element life. D-series: "heavy duty" filter element with a very high dirt and water absorbing capacity. Special version for windmill gearboxes! Windmill gearboxes are a perfect application for a Triple R bypass oil cleaner. 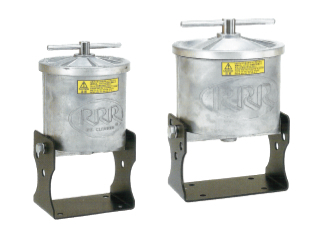 Triple R designed a special series for that purpose that allows longer oil life and reduces wear by removing solid particles, water, moisture and oxidation byproducts. The perfect "all-in-one" oil cleaning solution. Send your request to sales@dycom.co.id to get our Triple R windmill information package. Engine oil volume max 15 lit. max 30 lit. Filter model E50 X50 Main filter E100 X100 D100 Main filter Max. checking your engine or system condition. kind of contamination that is present in the oil. Normal condition: fine black deposit from carbon particles. Excessive amount of bright metal particles: the engine is facing abnormal wear caused by engine overload. Check if the engine had a proper maintenance and act accordingly. Excessive sludge and carbon deposit: oxidation products are be caused by excessive heat or (bio-)fuel mixing with the engine oil. Cracks in the element layers indicates a too high water concentration. Try to detect and repair the cause.